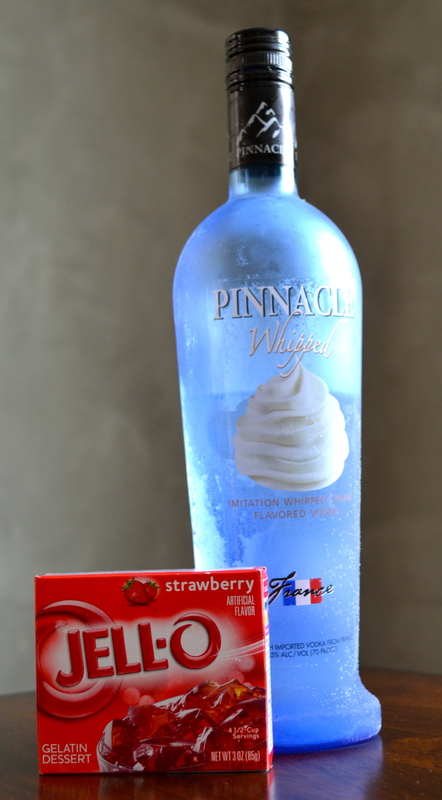 Strawberry and Cream Jello Shots | how 'bout some cake? Then you just follow the directions on the package. 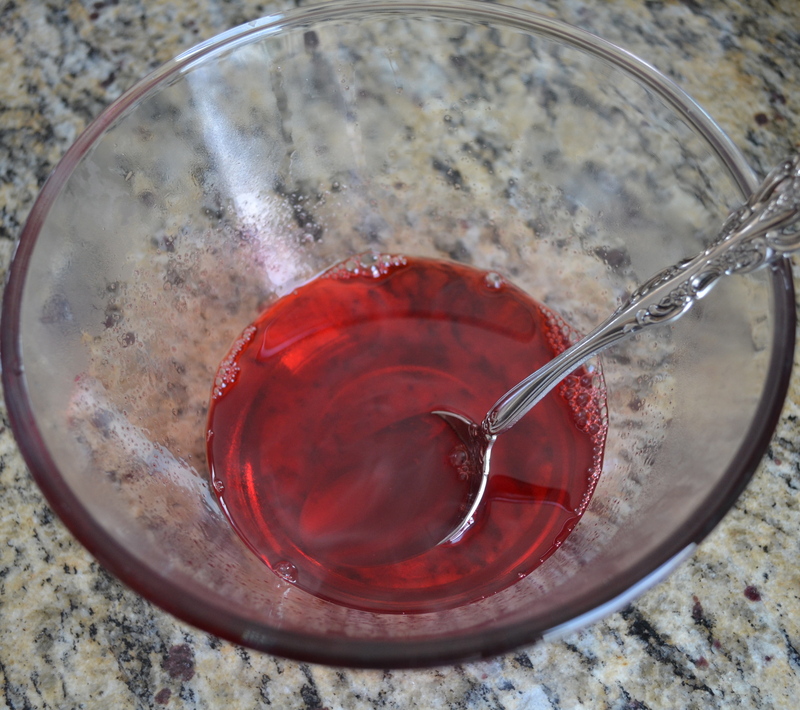 Mix 1 cup boiling hot water with the Jello powder until it’s totally dissolved. Then add a cup of VERY cold vodka (I store mine in the freezer beforehand). Then give it a stir and pour into your chosen container. 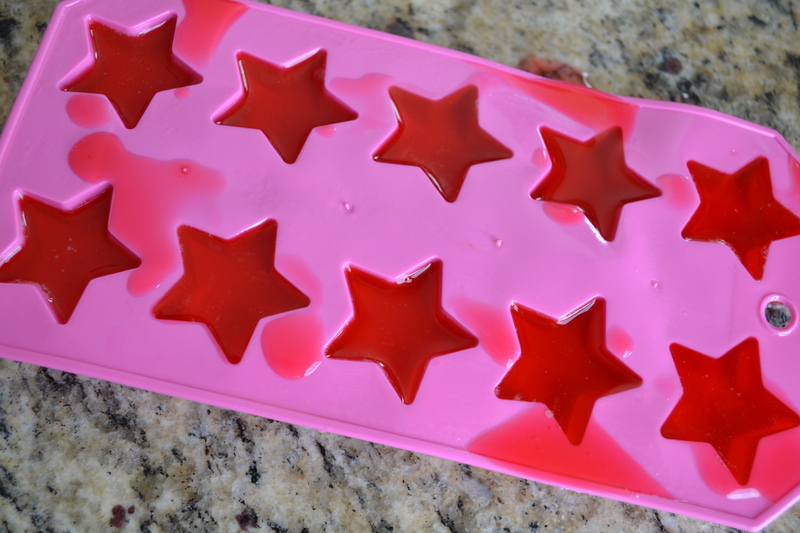 I found these cute little ice cube molds at Target for $1. A quick spritz of Pam helped them slide out smoothly after they cooled in the fridge. Now they’re the perfect, popable, bite-size grown-up treat! This entry was posted in Food & Recipes, Indulgences and tagged Cocktails, jello shots, recipes, shots, strawberry and cream jello shots. Bookmark the permalink. Sounds good. I have been wanting to try peach jello and peach schnapps. I need to make this!!! 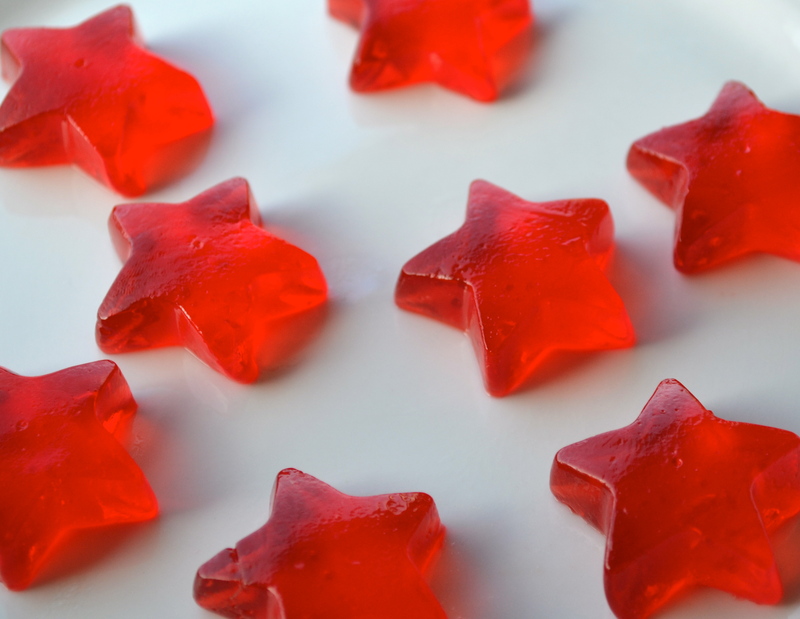 They weren’t too bad, but with this recipe I found that all I could taste was the alcohol and not the strawberry jello. Needless to say, I was intoxicated faster, but the first couple were hard to get down. best thing to do next time, is to make sure you add equal parts of boiling water and cold water and then just 3/4 cup alcohol not 1 cup…. I’m loving all the recipe’s I’ve seen! But alot of them are only showing what there made with. Not how to make or directions on how to put together an how to cook & how long. I’m also having a problem with pinning them so I can save them. Does anyone know another way to find this info out? Maybe another way to save? Please help me! I’m loving all but want more info & way to save everything I want..
Hi Kim! I’ll try to do a better job with the instructions in the future. Regarding pinning, I’ve never had a problem using the shortcut in my toolbar. It helps if you open the actual post rather than pinning from the homepage. I went in and added a “Pin it” button. Hope that helps! yes! The consistency was normal. I think the key is to REPLACE the cold water with vodka, as opposed to just adding vodka to the recipe. Otherwise they probably wouldn’t solidify enough. Simple to know how many it fills. 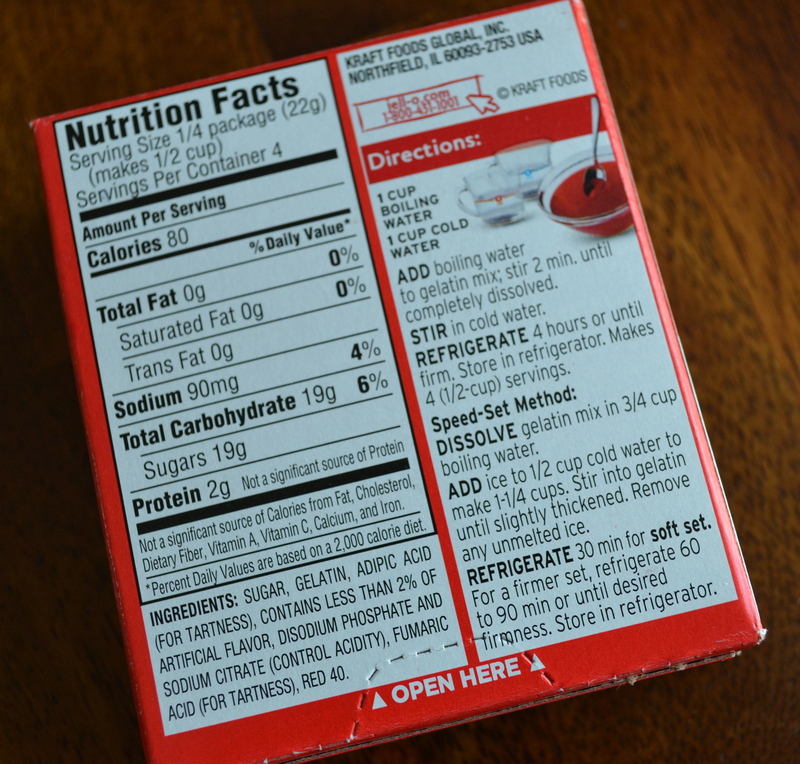 Take total amount of ounces (16 in this case) and divide by size of cup. Two ounce cups would make 8 shots. I can not get the flavored vodka where I live (Indonesia) but this will be great to try when I am home for the summer. I tried this but doubled the size, my shots have been in the fridge for 8hrs now and are still liquid. HELP!! Hi Stacey, Did you remember to double the jello too? I was thinking of making these for a girls weekend. Did you use the spray before you poured the jello in the molds? Also which spray did you use? I don’t think I used any spray. Hope you enjoy! Omg YOU’RE a problem solver!! I have that very same vodka and I was wondering what I was going to do with it! 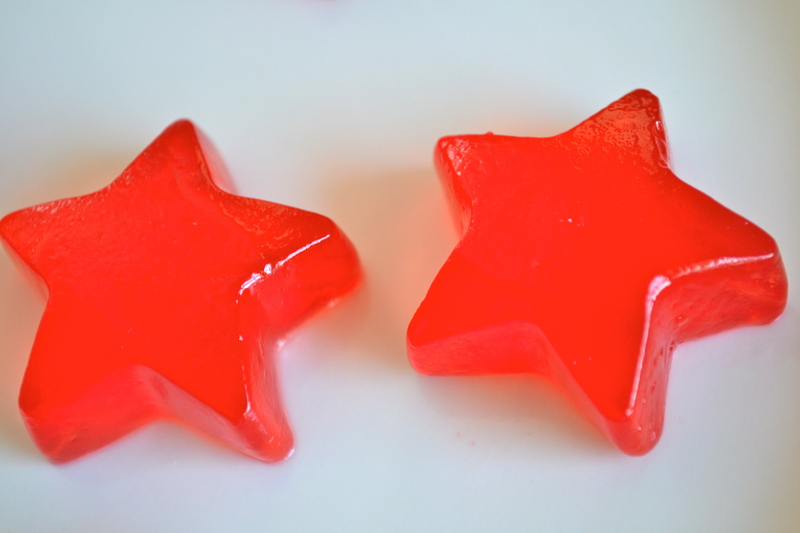 Quick question, I plan on making these and putting them in little 2 oz plastic cups , if I lightly spray the cups with pam as you did the tray , would Jell-O shot come out as easy?? Yes, I think it would help! I’ve always had to use my finger to scoop out those little shots from the cups when other people have made them but nobody ever seems to mind 🙂 Also a warning: These come out STRONG so some people would want to dilute the vodka with cold water. Just make sure the total amount of liquid stays the same, and is the right temp, or it won’t set. Thanks for reading and good luck! Wow looks yummy and I love jello. I been looking so long for this type of start molds where i can get this type of mold? I got these in the front section of Target where everything is just a dollar or two. It was a few years ago, though.